Today was a day to start projects. I know, I am ADHD. I like to start projects. Finishing is the trick. I had two trenches dug today. 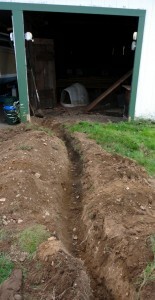 The first was a trench to bring power to the garage. I need electrical on the garage for next summer – and cleaning up the garage this winter will be a lot easier with lights. The only problem with the trench is that there is ledge at the end of the trench, and I won’t be able to get the buried cable down 12″. I’m still trying to figure out what I will do, but will probably put a concrete pad in the opening to the last bay of the garage to cover the buried cable. The second trench is to try to eliminate part of the water problem in the basement. Originally the house had a drainage system for the rainwater. However, in one corner the drainage system was clogged. I also think I am getting surface water draining down the hill and into the basement. I had a trench dug out along the foundation and will connect into the existing functioning rainwater collection system. Hopefully I can get both projects done this weekend. 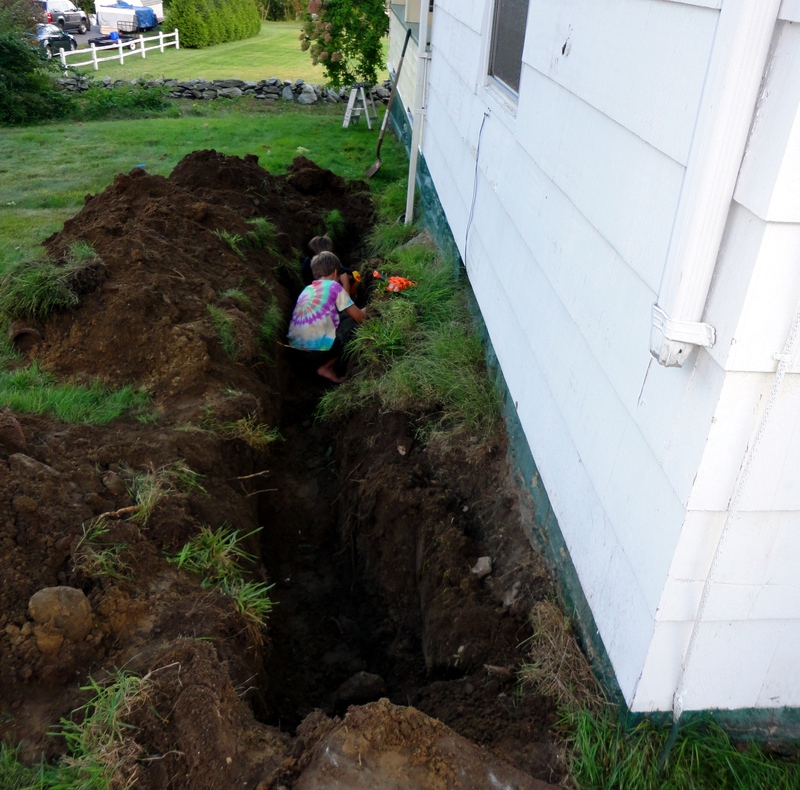 I may not get the power fully connected, but I want to get all the trenches filled back in by Monday. And we still have to paint the house in time for the wedding next summer. Will inspecting the trench along the north foundation wall.